Why is it called Gardeners Market and not Farmers Market was my first question to Nathan Moomaw, manager of the Sunday market on the corner of Bremen and Locust Streets. “I’m not sure,” he admitted. “I’ve asked people and gotten different answers. One was that this market would be for backyard gardeners to sell their excess produce. We actually don’t have large scale farmers. Most are small scale.” But they are not backyard gardeners. Nathan explained that hobby gardeners, who are not trying to earn a living, create conflict within a market because they can afford to sell low and this lowers the prices. The US Department of Agriculture reports that between 1994 and 2008 the number of farmers markets has increased by 167 percent nationally. This trend is seen in southeastern Wisconsin where the Farm Fresh Atlas lists 39 farmers markets in the five-county Greater Milwaukee area. Riverwesters are lucky to have one on Saturday on East North Avenue and the Sunday market on Locust Street. How are all these markets organized and funded? “Every market is different. A lot are run by neighborhood associations or business associations. Sometimes it’s a group of growers that cooperate and start a market,” Moomaw explained. The Rivewest Gardeners Market is run by the neighborhood residents. Vendors pay either a daily or a yearly fee, which makes up half the budget. Local business sponsors make up the other half. The nine business market sponsors this year are Riverwest Currents, Fischberger’s Variety Store, Bliffert’s Hardware, Riverwest Community Acupuncture, Riverwest Food Co-op, Milwaukee Network for Social Change, Centro Café, Sunrise Foods, and the Riverwest Neighborhood Association, which is the fiscal agent. The budget goes to pay expenses for the market. Moomaw has been donating his time as manager. The market requires that the products sold at the market are produced by the seller. How do you know sellers are abiding by the rule? Moomaw said that the only way would be to do on-farm visits, which in his volunteer position he has not had time to do. At this time, the producers are on the honor system. On an average Sunday, the market has about 14 vendors of the 22 registered. In addition to fresh produce and flowers, you can pick up bakery and chips, as well as shop for a unique piece of artwork or jewelry for yourself or someone special. The market accepts WIC and senior food coupons and may soon be able to accept food debit cards as well. It would be helpful to find out what the vendors gross each week, but Moomaw says they are reluctant to share that information. He estimates for some it is about $300 to $400. Moomaw can see some possibilities for improving farmers markets and making them work better city-wide. Bringing market managers together would be an asset to both producers and managers. Producers could have one source for information about which markets may have gaps in products that they could fill, and managers would be able to network and learn what producers are out there and what works and doesn’t work to draw people to the market. With the idea of creating a market managers association, the UW County Extension office held a training last winter that was attended by about 60 market managers. The office is considering applying for grants to form the association that would then be operated by members. Moomaw also sees potential in the Riverwest Gardeners Market. He sees it as an opportunity to bring a bit of social justice into our food system. 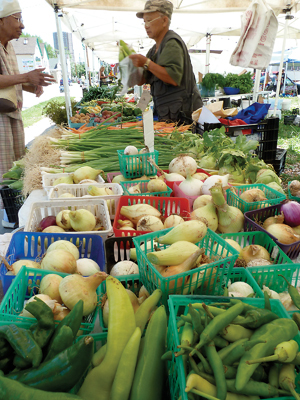 The market has many Hmong producers who farm small plots of land on the fringes of the city. It gives them an opportunity to sell their quality produce for a fair price. It’s also a good place for other small producers to begin. The market can also be a place to meet neighbors and enjoy the music pulled together this year by volunteer Lisa Knapp. Check the ad on page 14 for music listings.